The cosmic epic concludes, and Marvel Universe will never be the same! Exiled and on the run, Ronan the Accuser faces the deadliest women in the galaxy - including Gamora! As war rages across the universe, Richard Rider, the new Nova Prime, must marshal a united front against Annihilus and his lethal Annihilation Wave! Drax the Destroyer, Peter "Star-Lord" Quill, Moondragon and Phyla-Vell join the fight to guard the galaxy - but what chilling plan does Annihilus have for Galactus? Whose side is Thanos on, and what will happen when he faces down Drax? Can Ronan save the Kree Empire from Annihilus' forces? 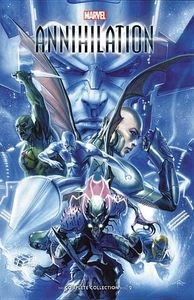 And how can Nova's ragtag team possibly defeat the Annihilation Wave, stop the war and save the galaxy? Collecting ANNIHILATION: RONAN #1-4, ANNIHILATION #1-6, ANNIHILATION: HERALDS OF GALACTUS #1-2 and ANNIHILATION: THE NOVA CORPS FILES.